SUPER NICE FOREST HILLS TOWNHOME WITH NO BACKYARD NEIGHBORS! Oversized detached 1-1/2car garage w/auto garage door opener w/2 remotes and 2-car wide driveway. 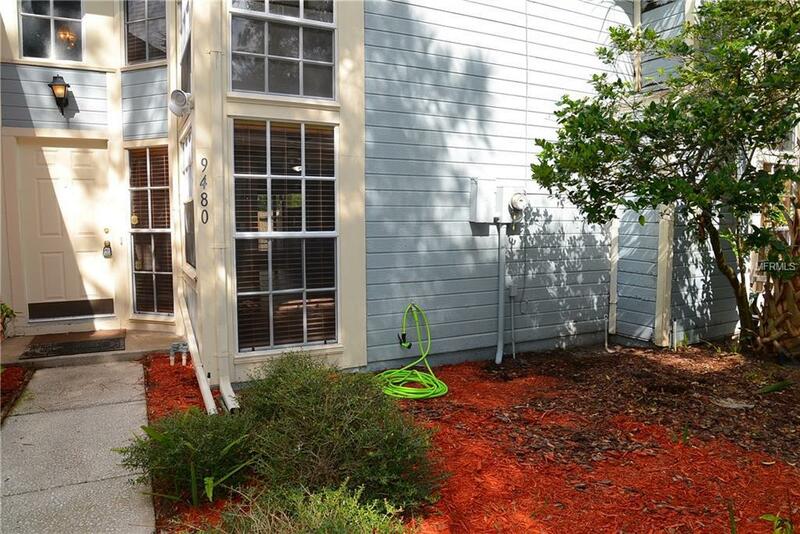 Large enclosed screen patio/porch w/new ceiling fan and large storage room. New hot water heater, newly installed Silver Oak Wood Plank laminate flooring at large 29' X 15' Family/Dining Room combo. Complete interior has new grey paint w/white trim, baseboards and doors giving a fresh new feel. 1/2 Bath is located downstairs, full Jack-n-Jill Bath upstairs has tub & shower and 2 separate vanities. Large Master Bedroom Suite upstairs has a very large walk-in closet. 2nd Bedroom has double walk-up closets and upstairs is fully carpeted. Kitchen has pass-thru window to screened patio/porch. Private, gated community pool is just steps away from your front door. Appliances include: range, refrigerator, dishwasher, washer and dryer. Great location with EZ access to I-275, USF, downtown Tampa, hospitals and shopping.